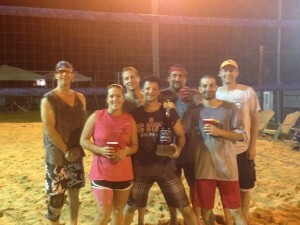 2012 Recap- The Growler has grown into North Raleigh’s Largest Summer Sporting Social Event of the summer. With more than 230 players from 6 different North Raleigh Swim Clubs. Most nights boasted more than 500 in attendance. PF Changs and Carolina Ale House were back with us again along with 5 new food sponsors, Lynnwood Grill, Sparians, Casa Carbone, Gonza’s Tacos and Tequila, and Chick-Fil-A at Townridge. RA Jeffreys (Bud, Kona, and Star Hill) was a sponsor along with over 20 other local businesses. This is a huge community networking event but most importantly gives back to a tremendous cause for children’s cancer research. Over $13,000 was contributed to St. Baldrick’s Foundation through sponsorships, registrations, food sales and individual fund raising campaigns. The event runs four weeks with teams competing a round robin format the first 3. The first night, all teams play at Springdale on 3 sand courts and 2 additional grass courts. Weeks 2 & 3 teams play at one of 4 different host club locations (Springdale, Lake Park, Crabtree and Greystone). The fourth week is the Grand Finally Championship back at Springdale where teams play a seeded single elimination tournament. Championship festivities include our St. Baldricks Shavees, raffle, fireworks, and The Championship Game for the coveted Growler Cup. Mark your calendar for 2013. Tuesday nights July 30th- Aug 20th, 2013.